The director of communications and sideline reporter for D.C. United was hit by a falling railing at Audi Field ahead of the brand new stadium’s inaugural match. ABC7’s Kevin Lewis reported that the railing hit the team’s reporter Lindsay Simpson not long before D.C. United took on the Vancouver Whitecaps Saturday at 8 p.m. in their first game in their new stadium. Pablo Maurer of MLSSoccer.com says there were multiple incidents of railings falling during the game. Lewis says staffers were later seen around the stadium securing railings with duct tape. The railings will undoubtedly be fixed, and the duct tape will be retired, and soccer will go on as normal for the team. But next time there’s some mishap at an older stadium, before buying the claims that “it’s falling apart, we need a new one,” remember that new ones can fall apart sometimes too. A plot of private land that Portland baseball backers were eyeing for a stadium has been sold to another developer, but they could still sell or lease it for baseball. Portland is definitely at the forefront of not just handing land to the local sports team for whatever price it wants, though of course it doesn’t hurt that there isn’t an actual local sports team in question right now, just the idle thought of one someday. D.C. United is about to open its new stadium with the help of $183 million in public money, and has belatedly noticed that its TV camera angles will be all screwed up because the sun sets in the west. Who could have known something like that? A group of Inglewood residents is suing to block the proposed Los Angeles Clippers arena project, which is not surprising; more surprising is that they attempted to serve Mayor James Butts with lawsuit papers during Tuesday’s city council meeting, causing the council to abruptly call a halt to the meeting and run away. The Cincinnati Reds are asking for $88,000 in state tax breaks on bobbleheads, on the grounds that they’re included in the price of ticket packages and not being sold separately, even though the ticket package costs more specifically because it includes a bobblehead. I shoulda been a tax lawyer. The Philadelphia Phillies are asking for $40 million in hotel tax money from Pinellas County for a new renovations to their spring-training stadium in Clearwater, but the county has run out of hotel tax money because it already spent it on other projects, including the Rays’ Tropicana Field and a spring-training facility for the Toronto Blue Jays, along with a bunch of museums and the like. Opportunity cost! D.C. United has finalized a tentative deal with Loudoun County, Virginia, for a 5,000-seat stadium for the soccer club’s second-division team. The complex will include four soccer fields, a training facility, office space, and a youth development program. The stadium would be located in Leesburg, Virginia, at Philip A. Bolen Memorial Park. Still, the deal needs to go before the county Board of Supervisors in January for approval. If approved, Loudoun County, Virginia, will provide $15 million in financing as well as the needed land for the project, as reported by Washington Business Journal. Okay, yes, I get it, this is actually for D.C. United‘s minor-league team (or B team, as they say in soccer [or football, as they say in soccer]), so it’s not entirely unlike the New York Mets and Yankees, say, having separate stadiums for their minor-league affiliates across town from their major-league facilities. Except, seriously, come on: The MLS stadium is only going to be in use 17 days a year, so they couldn’t let the B team use it on the A team’s days off? That’s what Orlando City SC does. It’s less common in European soccer leagues (the English Premier League doesn’t allow B teams), but there you’re talking about putting a second-division game in a 100,000-seat (well, 50,000-seat, anyway; see comments) stadium; if you’re worried that 5,000 fans will look bad in a 20,000-seat stadium, you probably shouldn’t be running an MLS team in the first place. This award-winning, 405-acre regional park has something for everyone – from the outdoor enthusiast to the seasoned athlete. The expansive property features baseball, softball, football, lacrosse, and soccer complexes, as well as trails, natural woodlands, picnic areas and a visitors’ center. Yep, that’s right: A Virginia county is set to consider whether to spend $15 million to tear down public soccer fields and replace them with private soccer fields. (Or maybe tear down lacrosse fields or natural woodlands — I haven’t found a map of where precisely the new stadium would go.) Some days, I don’t think this whole “explaining to people why sports stadium subsidies are a scam” gig is going very well at all. Clark County is smarter than Cobb County, it turns out: The Nevada county’s planning director, Nancy Amundsen, said this week regarding the new Las Vegas Raiders stadium: “If it’s determined that they need a pedestrian bridge at this location, or they need wider sidewalks on these streets, or they need streetlights here or there — any upgrade of the infrastructure based on the development on the site — we can request that in the development agreement.” The county commission still needs to do it, mind you, but at least thinking of it ahead of time puts them ahead of the folks who negotiated with the Atlanta Braves around their new stadium and its pedestrian bridges. That El Paso court case over whether the city’s new arena can host sporting events or just concerts and such turns out to be due to the city’s project consultant, according to one neighborhood group opposed to the arena: “David Romo says sports consultant Rick Horrow is to blame for the city stripping the arena ordinance of the word ‘sports’ in favor of ‘multi-purpose performing arts facility. '” If that name sounds familiar, it’s because Horrow has been selling small cities on his “raise the sales tax and build an arena plus a whole of other stuff” model for decades now — he’s the man who talked Oklahoma City into building a new arena with public money (which worked out okay in that the Thunder eventually moved there) and tried to push the same model for such things as an NFL stadium in Birmingham, Alabama (which would not have worked out okay at all). 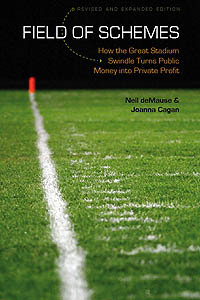 Romo cites Horrow’s own book, which advises, “De-emphasize, even in triumphant cities, the sports model,” and “Each individual project, on its own, will have little chance of passage. together, bundled, is the most enticing way to present the idea to voters.” Except when you write yourself into a corner with bond paperwork that says your new building isn’t for sports; but then, Horrow will probably have collected his fee by then and moved on to the next town. St. Louis’s MLS expansion bid, which pretty much disappeared after voters rejected spending $60 million on a soccer stadium this spring, may not be dead after all! According to alderman Joe Vaccaro, “I have been hearing rumblings and I have certainly no facts.” Or, you know, it might still be dead. Pictures of D.C. United‘s new stadium set to open next year! Spoiler: They don’t look like much. Also spoiler: They don’t really look like the stadium will be ready by midseason 2018 as the plan is (United will start the year on a lengthy road trip to accommodate the construction schedule), but soccer stadiums are a bit simpler to build than those for other sports, so maybe? “Colorful, glossy flyers urging residents to ‘Stop the Stadium!’ and ‘Take Action Now’ were left on doorsteps around the [proposed Miami MLS stadium] area late last week, paid for by a new group called the Overtown Spring Garden Community Collective.” David Beckham really can’t catch a break. I’ll be back here … Monday? Later than that? It all depends on how well I can navigate whatever weird metric internet they have where I’m going. In the meantime, use the comments on this post as your open thread on any breaking news, and buy David Beckham a muffin or something, he’s probably needs some cheering up. D.C. United‘s new $300 million stadium, which will get $183 million in land acquisition costs and tax breaks from district taxpayers, finally got final approval yesterday from the D.C. Zoning Commission, after design tweaks to make it look less like a prison. And just listen to how excited zoning commission members are about the project coming to fruition! The stadium probably won’t be a disaster of terrible traffic and empty streets on non-game days, at least not any more than all stadiums are. At least the zoning commission pushed back on some things, and got some small concessions, which is more than cities where cities where projects get final approval without anyone even discussing what the transportation plan will be. Yeah, it’s a low bar, but that’s about where we’re at with democracy these days. For those of you who can’t get enough of D.C. United stadium renderings that look pretty much just like the old stadium renderings: new D.C. United stadium renderings! Among the changes are: a retail corridor on the east side of the stadium along First Street, which will become a two-lane road with parking on each side, 14,000 square feet of retail attached to the stadium itself, and unspecified ‘additional future retail’ toward the south on First Street, according to a memo D.C. United’s lawyers sent to the zoning commission. A building along the south side of the stadium has been “reimagined and reoriented” to include 3,000 square feet or retail space, but will maintain a “bike valet” at its corner. Which is all cool — attempts at more non-gameday activity is cool, even if it doesn’t always work out so well. But D.C. United planners do seem to be trying to respond to community gripes, at least, which is the least they can do for their $183 million in public subsidies.